Here is a ‘preview’ look at the new chapter, in particular the chapter’s second company which features in my first short story submission. 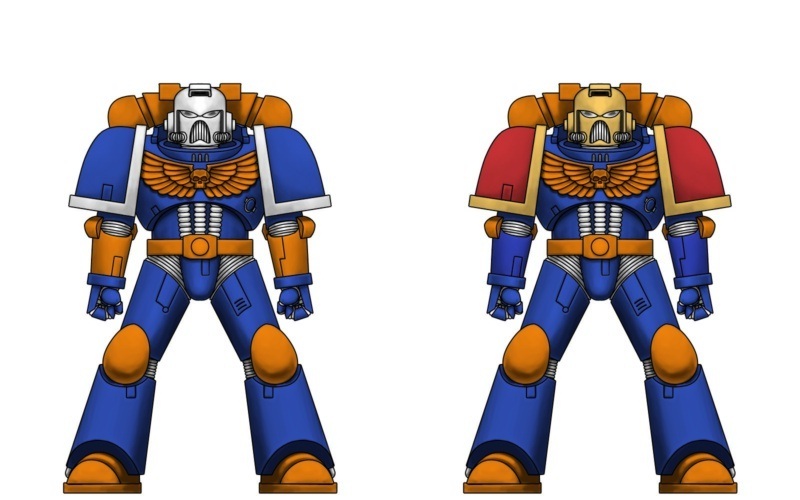 In order, these six images represent the six of the different components of the Angels of Retribution Second Company: Commander, Sternguard, Vanguard, Tactical Marine, Assault Marine, Devastator. If you notice, the company badge is not the actual chapter badge I had thought of. 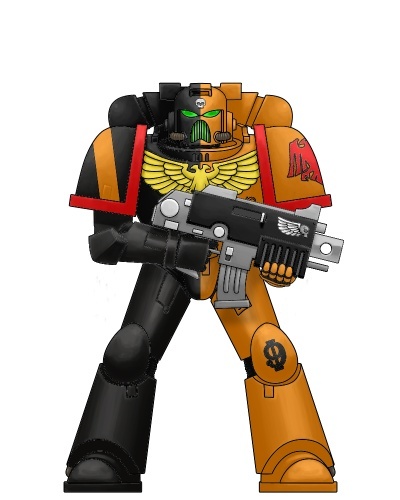 Not a good photoshopper and the Raven Guard insignia on Bolter & Chainsword’s SM painter was the closest match. It is a pretty nifty tool, and I like it much better than the other one since that one does not have access to wargear/weapons. My only complaint with the painter would be that lack of any diversification with regards to markings or weapons. If you look closely enough, the Commander has the roman numeral II on its left knee pad, but it isn’t visible because the power sword covers it. The numeral option is limited only to that knee pad and offers only 1 and 2 as options. Pretty restrictive no? Also no lightning claws or thunder hammers/storm shields, combat shields or the myriad other things. The Terminator painter doesn’t even have weapon or wargear options! Still all in all, this is an awesome tool to use and I quite like it, even with its restrictions. Anyways, another thing that has changed is the colour scheme. Reinventing the chapter in terms of name brought about this change. The way I was describing the chapter livery in my short story ended up being really clunky and verbose. Space within the sample was already at a premium as it is. I messed with a quartered colour scheme for a bit but it just didn’t click. So this is what I got in the end and I am pretty happy about it. Other than that, the gothic numbers on the veterans represents which squad they are from. Given the Terminator painter’s restrictions, I opted to just have the veterans in power armour and I quite like the results. The Commander’s roman numeral represents which company he is from. For the regular battle-brothers, their squad number is displayed on the right knee pad. And they all have red shoulder pad trims and a red chapter badge to show which company they are from. Getting the cloak/tabard/loin cloth colours right was a bit of a headache as well but I like what I got in the end. 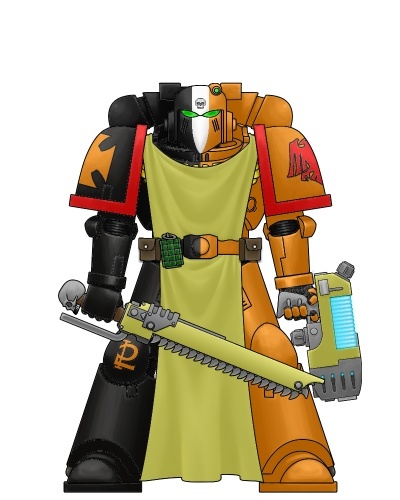 The Commander of course has his own colour for the cloak and loin cloth while the veterans have a unified colour, plus white stripes on their helmet to indicate their status within the company. The background itself for the chapter is largely unchanged. It is still the same chapter I wrote about, just a few details here and there have changed. Watch this very space for further changes. The Sons of Corax have modified the teachings of the Codex Astartes to suit their own needs and to fit their role as a fleet-based crusading chapter. Company captains are referred to as Commanders as they have responsibility not only for the battle-brothers of their company but also have flag command of a particular ship and its attendant escorts of the chapter fleet. The chapter also maintains a large number of Thunderhawk gunships, Caestus assault rams and drop pods. With all the resources at their disposal, each company Commander is able to act autonomously for long periods when needed. Consequently, the fleet-companies of the chapter rarely come together as one, unless it is by the writ of the High Commander for a major campaign. As one of the oldest chapters, the Sons are able to field sufficient quantities of the rarest arms, armour and vehicles meant for Astartes. All veterans are able to go to war in the revered suits of Terminator armour and several rare and advanced Land Raider variants like the Achilles, Prometheus and Ares. The Sons also maintain more Dreadnoughts than many other chapters combined, evidence of their close relationship to the Adeptus Mechanicus. Consequently, the Sons’ Techmarines are some of the most experienced and skilled of their calling. 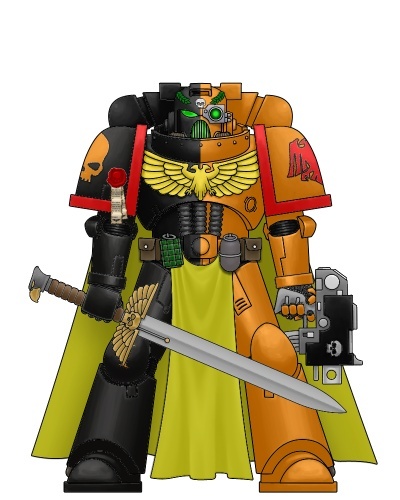 The Sons of Corax trace their origins to the Primarch of the XIXth Legion and they remain dedicated and committed to his teachings. They place great emphasis on infiltration missions and swift lightning strikes. Scouts are used to identify enemy locations and harass the enemy troops. Terminators and Veterans then deep strike via teleport homers and locator beacons planted by the Scouts while other troops engage the main enemy strength and move into position. The Sons rely on fast moving troops like Assault marines and battle-brothers on bikes and Land Speeders almost as much as other Chapters rely on their Tactical marines. Devastators and Tactical marines are afterwards deployed via Thunderhawk or Drop-pod after which the Thunderhawks are used in a support role to achieve air superiority as soon as possible. However, with their assault-dependent tactics, the Sons field few Devastator squads. The officers of the Chapter prefer to use lightning claws as their chosen armament and the Chapter possesses several sets of these weapons, thanks to their forge-ship, the Raven Song. The Chapter Master bears the Claws of Corax, a pair of master-crafted lightning claws forged in the time of Corax by Master-Magos Bachbergens of the Mechanicus for the Primarch himself. 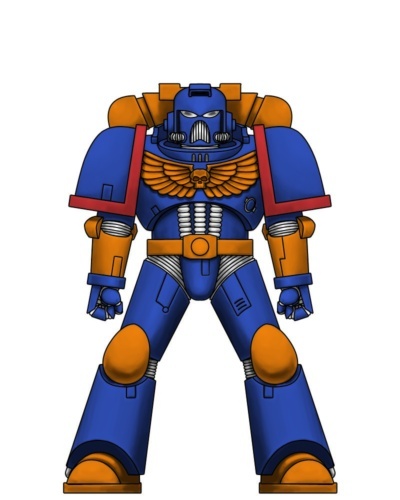 The Claws were instead bestowed by the Primarch to the Raven Guard First Captain and then later gifted to the first High Commander of the Sons of Corax by the Raven Guard Chapter Master at the time. 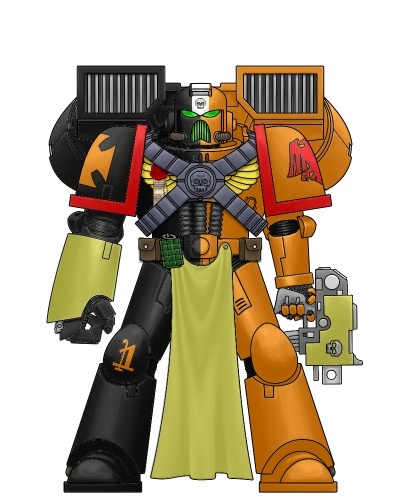 The Sons of Corax maintain a fighting strength of nine companies instead of the Codex-approved ten. These nine fleet-companies, as they are sometimes known, also do not fall into the typical categorization of Veteran, Battle, Reserve or Scout companies. The First Company contains the highest concentration of the Chapter’s Veterans, six entire squads, as well as two full squads of the most experienced Scouts. The Company’s Scouts are often deployed as a vanguard force that allows the Terminator squads to strike with precision at the heart of the enemy’s force. The Second through Fifth Battle-Companies are completely autonomous and self-sustaining forces in their own right. Each of these mainline Companies is able to field two combat squads of Veterans, six squads of Tactical Marines, three squads of Assault marines and two squads of Devastators and Scouts alike at full operational strength. The Sixth through Ninth Companies are not just Reserve Companies but are nearly as powerful as a Codex Battle-Company. The Sixth and Seventh Companies can field five squads of Tactical marines, two and half squads of Assault marines and a squad and half of Devastators. 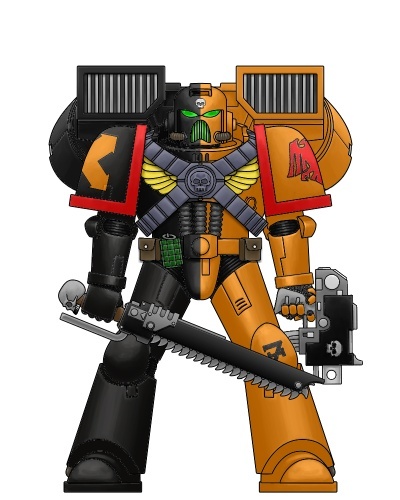 While the Eighth and Ninth Companies are organized along the same lines, the Eighth replaces its Devastators with Assault Marines and the Ninth replaces its Assault Marines with Devastators. Battle-cry : For the Honor of Corax! We bring Retribution and Death to our Foe!